CBS-TV’s Dan Rather left his job as a goat in 2004 after he published a fake document about President George W. Bush’s military record. But he was a hero Nov. 22 when 900 of New York’s media elite feted him at the annual black-tie Waldorf-Astoria banquet of the Committee to Protect Journalists. He was honored for “a lifetime of distinguished achievement in the cause of press freedom” by CPJ which is dedicated to helping journalists (mostly in foreign countries) who face assassination, arrest and other forms of persecution. Journalists were told to “fight the power,” fight for “freedom of expression” and not to give in to intimidation or become obedient. This message was given by reporter Eynulla Fatullayev, who was in prison in Azerbaijan in 2009 when CPJ gave him two awards. Rather, who said in 2004 that he would not have used the questionable documents “if I knew then what I know now,” sued CBS for $70 million but the suit was tossed out of court. CBS had retracted the story. Producer Mary Mapes was fired and three other producers were forced to resign. The documents allegedly backed up Rather’s claim that Bush did not complete required service in the Texas Air National Guard. Rather, 80, who had a 44-year career at CBS, blasted the news industry as being driven by profits and punditry rather than the public interest, reported Joe Pompeo of capitalnewyork.com. Rather was introduced by lawyer James Goodale who said “All the facts in that particular program were substantially correct” and that Rather himself was “correct,” according to Pompeo’s report. Attendees pay as much as $50,000 for a table and an additional $76,770 in dollars was raised by passing around white paper bags, reported Pompeo. ABC News anchor Christiane Amanpour hosted the first half of the program and NBC’s Brian Williams the second half. All this advice to reporters to “fight power” and not be “intimidated” or “obedient” is music to my ears and I wish CPJ would play this tune for O’Dwyer staffers and other American journalists. So far, CPJ, now headed by Sandra Mims Rowe, former Pulitzer Prize chair and currently visiting professor of journalism ethics, Arizona State University, has said it is too busy to look into this situation. Paul Steiger, editor-in-chief, ProPublica, was previous CPJ chair. I haven’t been imprisoned or tortured but have been threatened (twice) with being beaten “to a pulp” by a PR Society of America Assembly delegate and have been repeatedly accused of crimes such as “harassing” PRS leaders by sending them questions and “eavesdropping” by listening to Society conference calls. Members provide the O’Dwyer Co. coverage of such calls. This year PRS banned not only me but all reporters from its Assembly and circulated 23 pages of false charges against me. It only allowed me one rebuttal posting on its website before shutting down the discussion after four days. PRS has given a bad example of how to handle critical reporters, the National Press Club has said in urging the Society to drop the boycott. A similar rebuke was given by PR Watch. The Society has ignored such advice and I’m looking for more press and PR groups to weigh in on this subject. The U.S. press is in bad enough financial shape without 31,000 members of the PR Society being advised that “war” on the press is an acceptable response to coverage. Newspaper ad revenues plummeted from $49.4 billion in 2005 to $25.8B in 2010 or almost $24B yearly. If even half of the $24B went to pay reporters at the rate of $50,000 yearly, that would represent the loss of 24,000 jobs. Online income remains relatively small--$3.04B in 2010. Carnage is taking place in U.S. journalism although not in the form of murders, beatings and imprisonment. The effect is the same—far fewer journalists monitoring institutions. 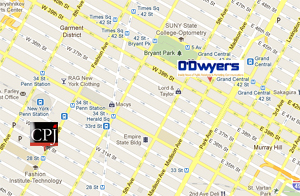 CPJ is only a few blocks from the O'Dwyer Co. I hope CPJ will at least talk to me and take some of the documentation the O’Dwyer Co. has compiled. Its offices are only a few blocks from mine. Assets of CPJ at the end of 2009, latest Form 990 figure available, were $12,134,907 vs. $10,488,781 in the previous year. A 501/c/3 charitable organization, it had revenues of $2,577,996 in 2009 vs. $3,564,737 in 2008. Value of investments (publicly traded securities) rose to $10.1M from $8.1M. Payroll was $1,876,050. Top CPJ staffers are executive director Joel Simon ($172K pay plus $8.2K of other compensation); deputy director Robert Mahony ($120K Plus $6.3K), and development director John Weis ($116K plus $12.9K). Gypsy Kaiser is advocacy and communications director. CPJ says on Form 990 that it works to “ensure that journalists everywhere are free to carry out their essential work to inform the public.” This should include the U.S. I was blocked, for no defensible reason, from visiting 47 exhibitors at the PR Society conference in Orlando Oct. 15-18. This was interference with a reporter in performance of his duties to the PR public which wants news of new products and services. CPJ offices at 330 Seventh ave. (between 28th and 29th sts. ), are about 12 blocks from the O’Dwyer office. I hope one of the experienced CPJ journalists will visit us. I went to last year’s banquet but did not meet too many of the media stars. Working press are seated in a balcony and have a menu of sandwiches and soft drinks. This year’s menu, according to Pompeo, included courses of vegetable tarts, salmon, lentils, asparagus and bread pudding. I didn’t receive an invitation to attend this year.